For Day 21 of the 30 Day Challenge, I turned to my growing collection of indie nail polish for inspiration. Today’s theme is inspired by a color, so I took that to mean I should look for inspiration from a nail polish shade. I recently picked up a mini of Pretty & Polished Private School. With the recent start of the school season and the feel of fall in the air, this one jumped out at me. 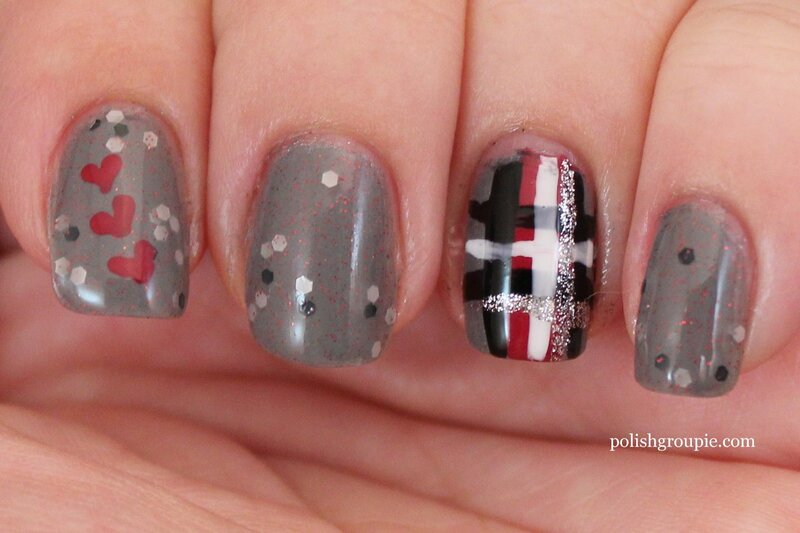 It’s a sheer gray with silver and black glitter plus a subtle red shimmer. 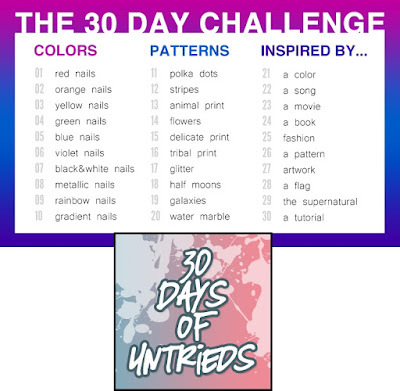 I hadn’t used it yet so that counts toward 30 Days of Untrieds, the other challenge I’m participating in simultaneously. I started with one coat of Sinful Colors Slate, a medium gray with a silver frosty shimmer, just so I wouldn’t have to use as much of my precious indie polish. I then applied one coat of Pretty & Polished Private School on each nail except my ring finger, which got a second coat of Sinful Colors Slate. I topped that off with a coat of Poshe fast-dry top coat. Pretty & Polished Private School was as pretty on the nail as it was in the bottle. It went on very will, with little-to-no glitter placement needed. Pretty & Polished is available on Etsy. Private school makes me think of school uniforms, so I created a plaid pattern on my ring finger, loosely based on this video tutorial from Cute Polish. I used Essie Very Cranberry (also untried), a berry-colored creme, to paint a wide stripe down the nail, then created a tic-tac-toe board pattern with Kiss Nail Art Paint Black striping polish. 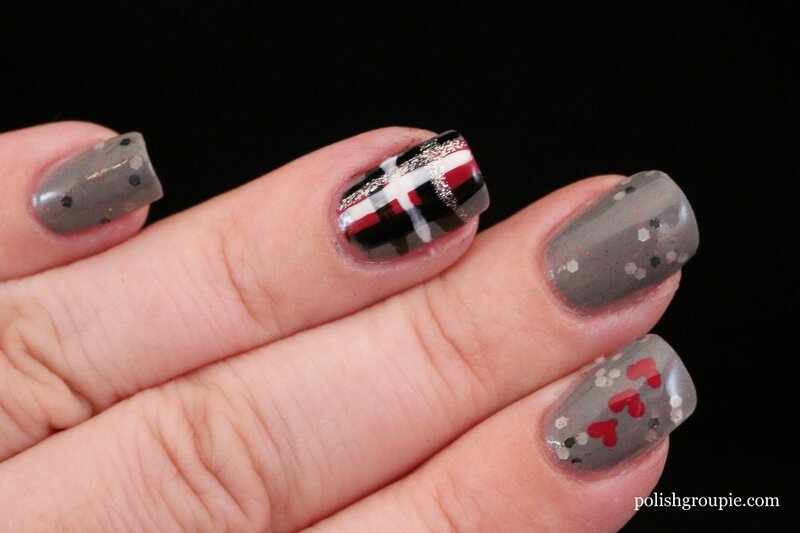 I used a Kiss White striper polish to create a cross pattern inside the black lines, and then Kiss Silver Glitter striper polish to add the last two lines of my plaid pattern. Then on my index finger, I used a dotting tool and Essie Very Cranberry to add three small hearts, the kind you might find scribbled on the front of a notebook or the inside of a locker door. I added another layer of Poshe on top of the nail art. Hope you liked my Private School-inspired manicure.